How Far is Green Blossoms? Ever wished for a home that nests in one of the most scenic surroundings and equally ensures your comfort and elegance, here is your chance to make all your dreams and wishes come true. Simple by opting to live in a project so majestic, Green Blossoms is a place that will elevate your lifestyle and will put you above all your hurdles and hassles. This project is thoughtfully crafted for the families who seek a fine living for themselves and to enjoy every moment to the fullest. It lets you forget the hectic life and allows you to breathe fresh air and rejuvenate your energy, this project nests perfectly in a greener space. 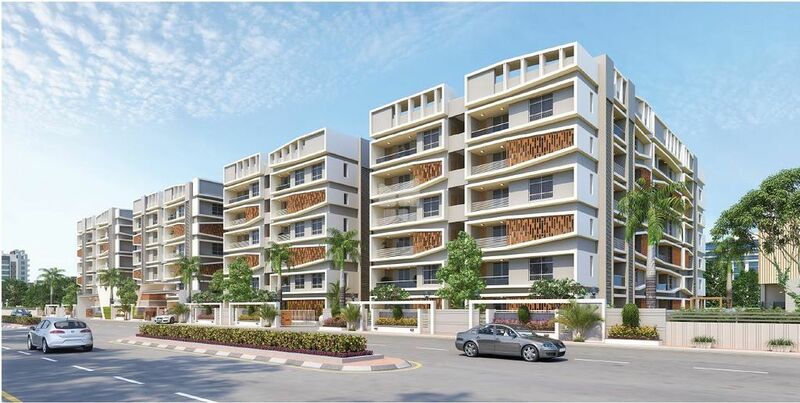 Green Blossoms is located in a very sought after hub of Kokapet, Hyderabad and it offers you meticulous ready to occupy 3BHK apartments for sale in Hyderabad. 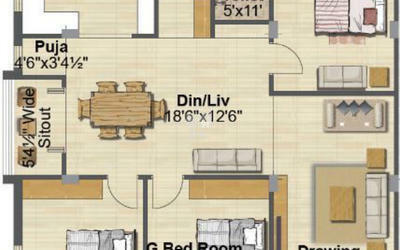 These apartments are well - equipped with modern day amenities and top-notch features. The apartments in Green Blossoms are boasted of all the fixtures and fittings, to ensure you have a convenient and hassle-free lifestyle. It has ample natural light and well - ventilation in the apartments. The project allows you to live close to nature and equally be closer to the city. The project location is so prime that it has easy access to other major parts of the city and also is in close proximity to the famed schools, hospitals, shopping malls and other civic utilities. Apart from that, it offers you an array of amenities, such as yoga/meditation hall, intercom, badminton court, jogging track, sewage treatment plant and cricket pitch. Rcc frames structure. 8" blcok for exterior walls and 4" blocks for internal walls. Internal and external double-coat cement plastering. Internal - two coats iuppam /putty and two coats of asian emulsion paint over a base coat of primer in all rooms. External:asian apex painting with wall care putty and texture. Common area:asian tractor emlsion. Granite platform with stainless sink. Provision for chimney , water purifier,microwave oven and washing machine in utility area. Teak wood frames with moulded skin shutters. 3- phase power supply for each flat. connected wire, modular electrical switches. One miniature circuit brekaer (mcb) for each room. Points for geaysers in toiletes, wasing machine in utility, refrigerator in kitchen or dining, microwave oven in kitchen, air conditioner in all bedrooms, tv and telephone points in living, master bedrooms and children's bedroom. Internet points provision in children's bedroom. E. W.c (two piece with white colour) hindware or equivalent make. All fixtures are c.p coated hindware or equivalent make. 2'x2 virtified tiles flooring for hall, bedrooms dining, kitchen and balcony. Anti- skid tiles in toilets. Granite flooring for staircase and corridor, s.s railing for staircase. Six / eight lifts with v2f. Glazzed ceramic tile dado up to 2'-0" height above kitchen platform. Glazzed ceramic tiles dado up to 3' 0" height.